DaVita HealthCare Partners Inc., a leading independent medical group and a leading provider of kidney care services in the United States, today announced its world headquarters building was awarded LEED Platinum Certification for Operations and Maintenance by the U.S. Green Building Council. "We believe in the connection between a healthy environment and the health of our patients and teammates," said Kent Thiry, CEO of DaVita HealthCare Partners. "Our environmental goals challenge us to steward resources while delivering high quality patient care." DaVita World Headquarters is the fourth LEED Platinum building in Denver and fifth in Colorado. The LEED Platinum certification is the highest recognition a building can earn from the U.S. Green Building Council. Alternative Commuting Transportation: Nearly 75 percent of teammates take public transportation, bike or walk to work. Water Reduction: Teammates helped reduce indoor plumbing fixture & potable water use by nearly 45 percent. Waste Management: Teammates helped increase the building's waste diversion rate (rate diverted from landfill) from nearly 30 percent to nearly 70 percent through composting and recycling. Optimized Energy Efficiency Performance: The building achieved 15/18 points possible because it has an Energy Star score of 90. A score of 75 indicates a high-performing building. DaVita Kidney Care also set new five-year environmental commitment goals. The plan focuses on opportunities to continue reducing its environmental impact on energy and water use, waste production and building and supply chain management across the country. Energy: Reduce energy use and carbon emissions by 10 percent per treatment. Water: Reduce water use by 30 percent per treatment. Buildings: Build one new LEED-certified clinic as a prototype, certify major offices as LEED Silver and implement internal certification for remaining buildings. Waste: Increase solid waste recycling to 45 percent and transition to reusable sharps containers in 70 percent of chronic care facilities. Supply Chain: Increase availability of environmentally preferable products and equipment, reduce packaging and conduct annual reviews with national vendors to assess sustainability practices. 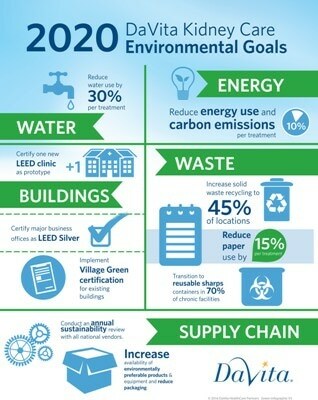 DaVita Kidney Care set its 2020 environmental commitment plan with higher benchmarks of similar goals outlined for 2015. The company met or surpassed three out of the five 2015 goals, including reducing water use by 30 percent per treatment and increasing procurement of environmentally preferable products and equipment. For more information on DaVita's environmental commitment and sustainability practices, visit DaVita.com/CSR.